It has been a little over a week since the free agency period officially opened, and big moves have been made, not only in free agency but in the trade market as well. Franchise stalwarts are set to have a new home in 2019. Former bitter rivals are now teammates (hello Antonio Brown and Vontaze Burfict). In all that action, some teams have improved more than others, and more specifically, some positional groups have seen some big-time reinforcements over the last week-plus. These five units stand out as the most improved across the league. Speaking of Brown, the Raiders have made a concerted effort to improve their wide receiver group, and no move was bigger than their decision to add the disgruntled star wide receiver from Pittsburgh in exchange for two mid-round draft picks. Brown provides an immediate, truly elite threat outside for quarterback Derek Carr – something that Amari Cooper nor any other wide receiver in Oakland has provided for Carr throughout his career. Brown’s overall grade of 94.6 since entering the league in 2010 is tops among all receivers with at least 250 targets over that span, and he’s done it with volume and efficiency. Brown paces all wide receivers since entering the league in categories such as receptions, yards, and touchdowns, while his 2.45 receiving yards per route run sit only behind Julio Jones in that span. No matter which way you cut it, the impact of adding Antonio Brown to the Raiders offense cannot be understated. Joining Brown as new additions to the Raiders’ receivers room are two field stretchers in Tyrell Williams and J.J. Nelson. Williams is coming off a 65.9 overall grade that ranked 66th out of 117 qualifiers at the wide receiver position last season. He was one of the few relatively young options on the market – at 27 years old – and has multiple years of proven production, as he has amassed at least 40 receptions, 700 yards, and four receiving touchdowns in each of the last four seasons. Nelson, on the other hand, is more of a shot in the dark. The potential big-play ability is obvious with his 4.28 speed, but the former Arizona Cardinal‘s production has been on the decline. After receiving an 82.3 overall grade in his 2015 rookie season, Nelson’s grade has declined each year since to just 48.9 in 2018. The Raiders will be hoping he returns to his 2016 form, where he caught 34 passes for 568 yards and six touchdowns as a secondary option for the Cardinals. Regardless, the additions of Brown, Williams, and Nelson more than make up for the loss of Jordy Nelson to free agency. It is the end of an era in Green Bay, as Clay Matthews will be suiting up for the Los Angeles Rams in 2019. Joining him on the departure from the Packers’ pass-rushing unit is the seven-year veteran and a former first-round pick, Nick Perry. With those two long-time presences in the pass rush gone, it left a need for edge rushers on their defense – a need that they have already filled through free agency with Za’Darius Smith and Preston Smith. Not only did they fill a need, but they improved the position. Za’Darius Smith is coming off easily his best season as a pro in 2018; he played a career-high 741 defensive snaps on a stingy Baltimore Ravens’ defense and recorded career-highs in overall grade (71.7), pressures (61), and pass-rushing grade (78.7) that ranked 14th among 103 qualifying edge rushers. Matthews ranked 54th in that same group, while Perry ranked 85th. Preston Smith, meanwhile, had a breakout season of his own as a member of the Washington Redskins. His overall grade of 76.9 ranked 19th among qualifying edge rushers – the first time he had graded above 70.0 in his career. Smith generated 53 total pressures on 442 pass-rushing snaps for an overall pressure rate of 12.0 percent which came in above league average. 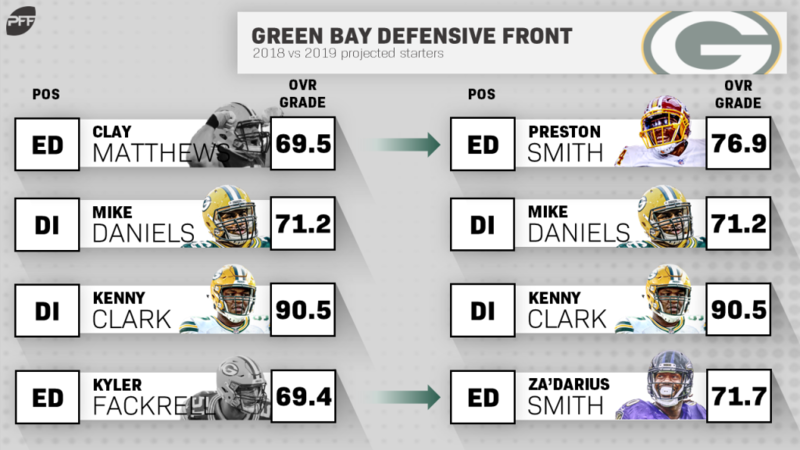 In acquiring the two Smiths, the Packers insert two rising pass rushers into the lineup to replace two players who are trending in the opposite direction. The result should be a much-improved edge rush which they can pair with their already formidable interior rush. With Myles Garrett on the defensive line, opposing offenses already had quite enough to worry about along the defensive front. Add in edge rusher Olivier Vernon and interior defender Sheldon Richardson, as the Browns have done this offseason, and that starts to form a severe predicament. The Browns added Vernon from the New York Giants in exchange for guard Kevin Zeitler in addition to a late-round pick swap. Though Vernon got a somewhat negative reputation for underperforming his contract in New York, his grades highlight a player that is still performing at a high level. Missing time with injury last season, Vernon was able to put up an 86.3 overall grade across 665 defensive snaps with Big Blue, and he consistently beat his blocker with a pass-rush win rate of 18.2% – ninth among 101 edge defenders with at least 150 regular season pass-rush snaps. 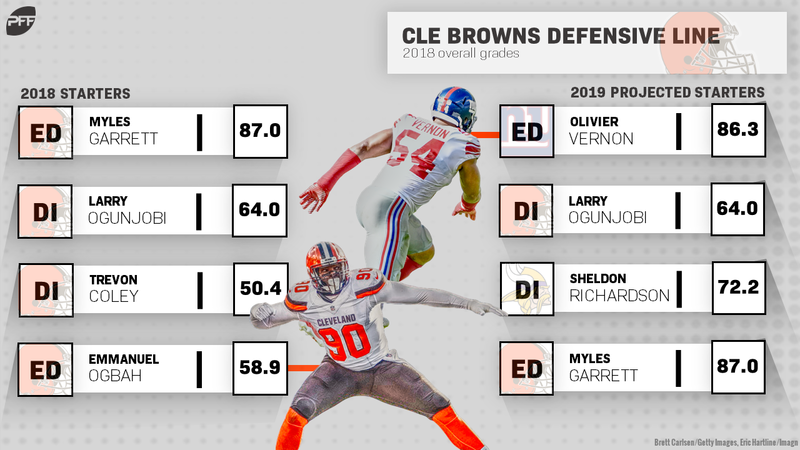 Taking that into account, Vernon is a significant upgrade over Emmanuel Ogbah, who ended 2018 with an overall grade of 58.9. As for Richardson, he has been remarkably consistent since being drafted in the first round by the New York Jets back in 2013. He has played at least 600 snaps each season in the NFL and has graded at 70.0 or better every year, including an overall grade of 72.2 last season with the Minnesota Vikings. At his best, Richardson is a force in the run game; he picked up run-defense grades of 88.0 or higher in 2013, 2014, and 2016. It has been a couple of years since he has been in that elite tier, but Richardson has remained solid as both a pass rusher and run defender, providing a clear upgrade on the 614 defensive snaps played by Trevon Coley on the interior in 2018. The early stages of the 2019 offseason have seen the Bills lose one starter on the offensive line – John Miller (64.2 overall grade, ranking 16th among 40 qualifying right guards) – and gain two starters in center Mitch Morse and tackle Ty Nsekhe. Last season for the Bills, Russell Bodine, and Ryan Groy split time at the center position with neither player making much of an impact. Morse is set to step in as the starter and will be a stable, consistent presence at the helm of the offensive line. Discounting a 2017 season in which he only played 383 snaps, Morse has graded at 69.0 or better in every season that he has played. He has been especially adept as a pass blocker, something that will surely make quarterback Josh Allen happy; over the last two seasons – 789 pass-blocking snaps – Morse has allowed just 12 pressures, and only one of those was a quarterback hit. The center has not been charged with a sack allowed since his rookie season back in 2015. Joining Morse on the line will be Nsekhe. He’s an interesting case in that he is 33 years old, and yet, he hasn’t lodged a full season as a starter at tackle. It’s not for lack of strong play when he has seen the field – as shown by his overall grades across his last four seasons with the Washington Redskins. Nsekhe has played between 300 and 450 offensive snaps for the Redskins each of the previous three seasons, and his grades were 78.3 in 2016, 60.3 in 2017 and 67.8 last season. Those grades don’t blow you away, but they also don’t seem to fit with a journeyman who has played with ten different teams across professional leagues. The starter opposite Dion Dawkins last season in Buffalo, Jordan Mills, finished 2018 with an overall grade of just 56.0. Nsekhe is an upgrade there, and he will finally get to show what he can do with a full-time starting role in the NFL. Unlike the other groups on this list that had multiple additions to each unit, there was only one addition to the Jets running back room, but anyone who was followed football over the last five years knows that Le’Veon Bell is a one-man army at the position. After sitting out the entirety of the 2018 season when the Pittsburgh Steelers placed the franchise tag on him, Bell should have fresh legs heading into 2019 – a welcome reprieve. In 2016 and 2017, no running back had more regular-season rushing attempts than Bell’s 582 and his 160 receptions led all running backs by 34. He’s the definition of a bell-cow back. It’s not just volume, though; since entering the league, Bell ranks in the top 10 at the position in missed tackles forced per attempt, rushing yards after contact per attempt and rushing attempts per fumble among qualifiers at the position. Where he is most valuable, however, is as a receiver. No running back had a bigger impact as a receiver than Bell did from 2013 to 2017 – 308 receptions (1st), 2,640 receiving yards (1st), 117 first downs receiving (1st), 72 missed tackles forced (2nd), etc. He can run routes out of the backfield, but he can also line up either in the slot or outside – a valuable commodity in today’s NFL. His 432 routes run from the receiver position in the regular season since 2013 are easily the most by a running back; the only other running back to have more than 300 is Andre Ellington, who was used as primarily a wide receiver at times. There is merit to the argument that the Jets paid Bell too much money based purely on positional value and the ability to plug-and-play less talented running backs with marginal losses in production. What can’t be argued, though, is that Bell is very talented, and positionally he is a big upgrade over the committee of Isaiah Crowell, Bilal Powell, Elijah McGuire, and Trenton Cannon that the Jets trotted out in 2018.